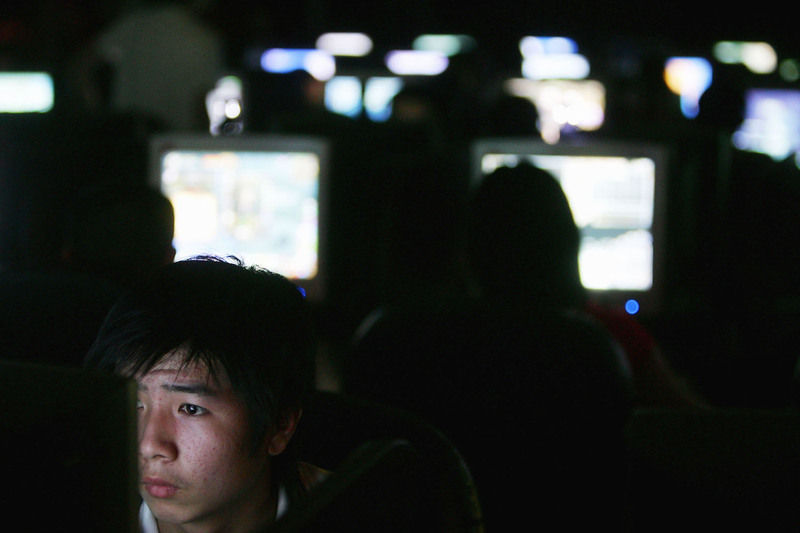 Young Chinese play online games overnight at an Internet cafe in Wuhan, Hubei Province, June 11, 2005. China’s approach to the Internet has already spread beyond its borders. Turkey blocked all of Wikipedia just days ago. But the impact of the Digitized Chinese Encyclopedia is not so clear. If it is actually going to be a wiki—in the sense of a website where users can build, edit, and add to entries freely—then contributing scholars may have some leeway in their work. Just because the writers all come from national institutions doesn’t mean they all think the same way. Witness Cai Xia, a professor at the Central Party School who has criticized state violations of the law and called for internal Party reform; Yu Jianrong, rural sociologist at the Chinese Academy of Social Sciences and unabashed liberal; and many other outspoken people “in the system.” If those scholars are part of the Digital Chinese Encyclopedia team, they may have some sway. If they don’t have any sway at all, the Chinese Encyclopedia will still have to compete with other well-established platforms. Many entries in Baidu Baike, for example, are editable, though there are predictable exceptions, like the entries on Xi Jinping and the Dalai Lama. But not the entry on Wikipedia, which informs readers that, while Wikipedia Chinese was blocked in 2015, versions in other languages are still available in China. It goes on, “Wikipedia can be accessed by modifying the hosts file and scaling the [Great Fire]wall. Because of this, Wikipedia content is often copy-pasted onto other websites.” So why turn to the official encyclopedia when you can find nuggets like these elsewhere? Wikipedia Chinese is currently 90 percent blocked by the Great Firewall, according to GreatFire.org, while Wikipedia Cantonese is 100 percent blocked. But the English site isn’t blocked at all. Nor is the classical Chinese site, including its entries on June Fourth, the Democracy Wall, and the Jasmine Revolution. So in order for the Chinese Encyclopedia to dominate, not only will it have to strictly police its contributors, it will also require regulation or total shut-down of similar websites and total blocking of Wikipedia. Even with all that, netizens will find cracks in the wall. As for this type of control spreading to other countries, it depends on what other places can afford, financially more than politically. Keeping the national intranet scrubbed isn’t cheap. First things first. I think it’s inaccurate to compare the proposed encyclopedia with Wikipedia. The whole point of Wikipedia is that it is a bottom-up project, which attempts to build a collective undertaking on the basis of the wisdom of crowds. It is self-generated and self-policing. The Chinese project is nothing other than an online version of the enormous, multi-volume encyclopedias that used to fill the studies of schoolteachers and the upwardly mobile worldwide. It is, perhaps, better to call it the Encyclopaedia Sinica. To be sure, this encyclopedia is one of the flagship parts of the broader project, as official parlance has it, to ensure the dominance of the Party’s voice in online discourse. Moreover, this project also encompasses China’s claim to sovereignty in cyberspace: the Chinese Internet authorities assert that as governments are entitled to effective control over their territory and population without interference from other states—as well as non-state actors—in the real world, they are entitled to the same in the online environment. This assertion has drawn opprobrium from various Western observers. The problem, however, is that these observers usually derive their critique from a conception of information and communication technologies that has proven to be, at best, sadly naive. Where it was held that free and open communication of information would result in the spread of diplomacy, acceleration of economic and social development, and the buildup of a global community, it has now become clear that technology can equally be used to incite armed conflict, subvert democratic processes (including in the U.S. and the U.K.), and cause severe economic disruption. One particular issue in politics is the erosion of authority due to the enormous potential of connectivity the Internet provides. Loonies and conspiracy theorists find in Internet technology a means to overcome the inability to compete with authoritative sources of information in the real world—or to put it short, fake news. Now, China has considerable experience in regulating public speech, even before the advent of the Internet, in a way that leaves little doubt as to the source of discursive authority. But, I do not foresee that Western countries will take over the Chinese method of having a highly centralized bureaucracy to continuously monitor what is fit to print (or retweet) and not. Mechanisms to reassert some form of authority will be developed, but they will take into account the sensitivities of the particular countries involved. For instance, Facebook may develop user-driven fake news detection and reporting systems. However, what will be taken from China’s approach is an increasingly powerful role for states in cyberspace. Populations around the world are primarily looking to state actors to protect them from harms online. As a result, many states, including the United States, are now behaving as if they have the right to exercise sovereign power in cyberspace, even as they continue to berate China for claiming its own. For China, it is a strange vindication: in many ways, it got the Internet “right” far earlier than Western countries, who are merely now (in the Chinese perspective) swinging round to China’s commonsensical point of view. In conclusion, it must also be noted that the China-U.S. (or Western) dimension is important, but not the only one in this respect. Increasingly, China’s approach to control starts to look highly prudent to many governments in the global South. Therefore, questions of China’s influence must not be merely seen in the light of whether “we” would take over a Chinese example, but also how the comparative prestige of China’s approach is perceived in third countries. Unfortunately for Western observers, the answer might be disappointing. China’s ability to control the Internet is vastly overestimated and the process of information control is often misunderstood. While the government might be quite ambitious in its aspirations for information control, observers should not mistake ambition for realized goals. We should also not conflate censorship consequences with government intention. Foreign governments can certainly adopt various information control practices pioneered by the Chinese government. But there is no single “Chinese model” of censorship worthy of emulation. It is fragmented across different units that sometimes work at cross purposes. It is also delegated to commercial entities that are concerned more with profit than faithfully carrying out government directives. Fragmented authoritarianism, a model of Chinese governance developed more than thirty years ago by Ken Lieberthal and Mike Oksenberg, continues to accurately depict China’s multi-level, decentralized bureaucracy. China’s propaganda bureaucracy is massive, but it is also divided across different levels of government, from the central government down to city districts and townships. Even apart from these specialized offices of propaganda and information control, most other government units have propaganda offices so that they can control their own messaging and direct line to the public. This creates a lot of propaganda, but there are diverse voices, competing interests, and mixed messages. Apart from the government’s wholesale blocking of certain external sites, such as Facebook, Google, and Wikipedia, much of the work of information control is delegated to private media companies that have their own commercial interests. This “delegated” censorship makes it distinctive and potentially attractive as a model of censorship for other state capitalist regimes that value control and commercial success. However, delegated censorship operates under two contradictory needs –to make profits and to control information. Many observers of Chinese information control do not sufficiently recognize the importance of these two characteristics: Chinese censorship is fragmented across China’s multi-level system of government and it is delegated to companies that also want to earn profits and boost market share. As Anne Henochowicz notes in her post above, the Chinese Great Firewall has cracks. These cracks are unavoidable given this delegated and fragmented model of information control. Delegated, fragmented censorship allows media companies to evade censorship controls when different units of the government issue conflicting orders, when they perceive limitations in the government’s ability to monitor compliance with orders, or when the cost of disobeying orders is less than the reward they can expect from defying orders. Media companies watch carefully whether competitors are censoring or allowing forbidden material. If one company is ignoring a government directive, another company may do so as well. There often appears to be a race to the bottom among social media companies where large companies are continually trying to censor less than their competitors. This struggle between information control and market incentives has three consequences. First, there are large gaps in censorship. A large amount of collective action and regime-critical content does not end up censored on Sina Weibo. Similar to what Anne mentions about wiki sites, a recent large-scale analysis of 13.2 billion Sina Weibo posts (by Qin, Bei and Strömberg in the Journal of Economic Perspectives) shows that Chinese censorship is not monolithic or all encompassing. Second, the fragmentation of the government and the competition between media companies produces large variation in what is censored or allowed across space and time. Some provincial propaganda offices, for example, will vigorously censor information about its leaders, but allow free discussion and criticism of those beyond their borders. Finally, with the variation that comes from delegation and fragmentation, there are no axioms when it comes to censorship. As we argued recently in another space, China deploys vast resources to “guide public opinion” in its favor, but it does so in an erratic, incomplete, and often contradictory manner. It might provide the tools of information control for aspiring autocrats around the world. But it does not provide an effective “Beijing model” of censorship. The question is not “can” China’s approach to Internet control spread around the world but “how” and “to what extent.” The once popular view that the Internet would ensure and encourage the free flow of information and democracy is no longer as apparent. The Internet both enables and challenges authoritarian regimes. China is a prime example of this tension. China’s approach to Internet control can be broadly divided into two categories: internal information controls that are primarily targeted at domestic audiences and external agenda-setting efforts to shape the norms of global Internet governance. The recent restrictions on online news reporting, the state-sanctioned Digitized Chinese Encyclopedia and measures taken to warn Party members of “making irresponsible comments and publicly opposing key central policies” (妄议中央) on WeChat are additional examples of the state’s effort to build what historian Timothy Cheek called a “directed public sphere” in China—a public space for expression that is not entirely independent but in which the state “guides” ideas “for the good of the society and the people.” It manifests the Chinese Communist Party’s long-held stance on the link between information controls and regime stability, that failure of guiding public opinion would lead to social instability and loss of political power. What we are witnessing today is China dedicating more and more resources to external norm-shaping. The efforts seem to be working. While China’s restrictive policies on Internet management, justified on the basis of social stability and national security, used to be criticized, rejected and ridiculed by democracies and were embraced by only the circle of authoritarian regimes, recent international events have unintentionally presented China an opportunity to advocate and legitimize its approach to information control. For example, the Snowden revelations in 2013 has somewhat shifted Internet freedom watchers’ attention away from China to massive U.S. surveillance programs. The Chinese government has used these disclosures to swipe back, accusing Western countries of imposing double standards on Internet freedom. Incidents such as shared photos of terrorist attacks around the world, ISIS’s social media promotions and live-streaming of murders on Facebook have led commentators to push Internet companies for more content controls on their platforms, a view enthusiastically endorsed by Chinese regulators. The “fake news” debate started by U.S. President Donald Trump and Russia’s hacking and disinformation campaign has emboldened some Chinese commentators to justify media crackdowns. Whereas to authoritarian regimes, the appeal of China’s Internet approach largely lies in its sophisticated censorship system (Russia, for example, is trying to enlist China’s know-how to build its own “Great Firewall” for censorship), regulators in non-authoritarian countries, citing national security reasons, are increasingly interested in China’s stances on AI-powered big data management, localization of data storage, and collection of user information. It is difficult to assess how much China’s approach to Internet control has influenced the world. However, it is reasonable to say to the “China Solution” of state-led Internet management is gaining more support as calls to securitize the Internet get louder.